Sweet diamond heart pendant in 14K white gold with .08ct. total diamond weight on 18" 14K white gold faceted cable chain. 1ct diamond hoops in 14K yellow gold Emerald and diamond ring in 14K white gold Blithe Earrings Turquoise and Stalactite Diamond earring jackets 1/2ct total diamond weight. 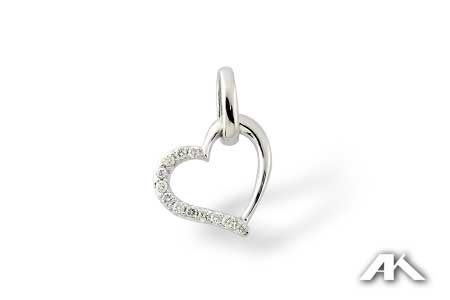 Shimmering diamond earrings in 14K white gold. Stylized cross necklace in sterling silver Diamond hoop earrings in 14K two tone gold-1/3ct. 1 ct total diamond weight ear studs in 14K white gold.